This product requires the base game Assassin's Creed® Syndicate. 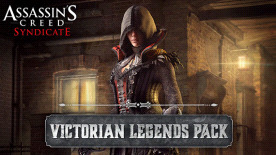 The Victorian Legends pack pays tribute to some of the most famous novels of the Victorian era. Underwater adventures, vampires and man-made monsters come to life as state-of-the-art weapons and gear that's sure to give Jacob & Evie a stylish edge over the Templars. This Animus trickery contains an outfit for Evie, three weapons and two pieces of gear. Players need to be level 7 and above to equip these. Please note: This content requires the base game Assassin's Creed® Syndicate in order to play.